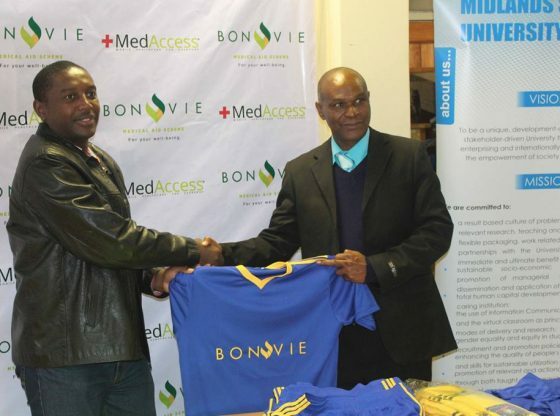 The Midlands State University staff soccer team has a reason to smile after receiving a donation of a new kit from Bonvie Medical Aid Society. The handover of the soccer kit was done at a ceremony attended by authorities from the two institutions at the University’s Gweru Main Campus. In his remarks during the ceremony, Bonvie Medical Aid Society Research and Business Development Manager Mr Innocent Machiwenyika, said the donation is a way of enhancing the good relations that exist between his organisation and the University, adding that his company fully supports the institution in all its endeavours. ‘For Bonvie we have started doing workouts and we have started with Harare, Masvingo and Bulawayo. So in a nutshell we are looking for a place in the Midlands Province where we start having fitness classes. It might not necessarily be a gym but we want to start having fitness classes on a daily basis so that anyone who is an MSU employee can actually attend those fitness classes,’ he explained. Expressing his gratitude to Bonvie Medical Aid Society, on behalf of the University, the Acting Registrar, Mr Ivene Gumbo quoted scripture from the Bible saying, ‘idle hands are the devil`s workshop while idle lips are his mouth piece’ and thus underscored the need for members of staff to be active through sports. ‘So Bonvie, as you come to MSU, you are fighting idleness. Idleness is very dangerous to the person who is a living being. So we hope your donation is going to assist all the members of staff not to engage in those ill activities,” said the Acting Registrar. Secretary General of the Midlands State University Staff Sports Association, Mr Qinisani Bhebhe, said the donation is a confirmation of the cordial relations between the two institutions. ‘It is a relationship based on promoting good health, ensuring adherence to healthy lifestyles in tandem with our University health policy. This is in line with our vision of not only a fit and healthy curriculum, but it is also part of our mandate to ensure that we have healthy staff and students,’ said Mr Bhebhe. The Midlands State University Sports Policy advocates for mass participation in sports and recreation activities, promoting sports infrastructure and enhancement of human capital skills in coaching, administration, officiating and athlete development among other issues.